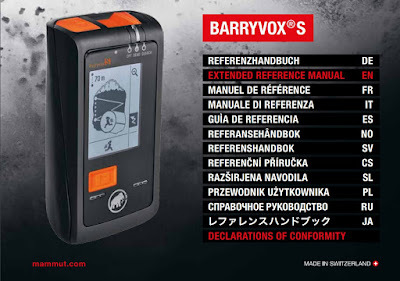 Your new Mammut avalanche transceiver comes with a user manual printed in several languages, but if you like to get the most from your equipment it's worth going online to download a copy of the Barryvox S Extended Reference Guide (link) or the Barryvox Extended Reference Guide (link). The Extended Reference Guide is available online as a PDF, and contains additional information on advanced searching that is not found in the basic User Manual included with the beacon. 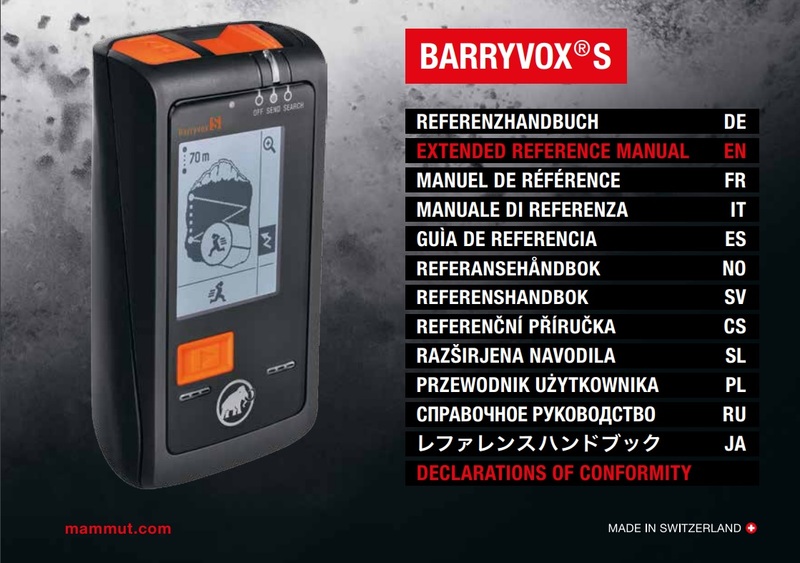 The Barryvox S Extended Reference Guide contains the basic User Manual that came with your beacon, but also contains additional comprehensive information for your BarryvoxS on device settings, advanced search and rescue techniques, and in particular the "Pro Search" option and the alternate search mode, which are not contained in the more basic User Manual. Anyone who will ever practice alternate search strategies such as micro strips, micro-box or 3-circle should consult these instructions on utilizing the advanced search functions of the Barryvox S. It is an important and valuable resource for advanced recreational and professional users—and all educators. The Barryvox Extended Reference Guide contains additional information on conducting Group checks before a tour, more comprehensive rescue strategy, and more comprehensive information and guidance for conducting multiple burial searches and companion rescue guidance. If any of the above describes you, you can download a copy of the appropriate Extended Reference Guide directly at the links above, or through the Beacon Info landing page on this blog (along with other resources). Hi--There's a full couple blog posts to answer your questions! If you're in the US or Canada perhaps a phone call would be most helpful, maybe send an email to davef@mammutusa.com and we can set up a call or I can send you some other resources. Quick answer is that I think you may be overthinking the beacon. Users who will never practice alternate search strategies such as micro box or micro strips or 3-circle should leave the beacon int he default user settings and dont change anything. Based on your depth of knowledge I would recommend you turn the pro-search function to "on" and not change anything else from the default settings--this stays on all the time, you never switch back and forth between pro search "on" and "off". I am told there are some who prefer some very specific other settings, but 99.9% of advanced users should not change any of the other defaults except perhaps their preferred visual guidance display (this allows you to choose between the smart fine search and the "cross" fine search from the Pulse). You'll have analog tones that you can use to identify a false-positive or signal overlap while you follow the digital distance/direction in most cases. If you identify a discrepancy between the display info and the analog tones, then you can go to alternate search mode only to perform a micro box or micro strip search or to do a long-range "scan" to listen for interference, etc--this will automatically default to the correct mode based on whether there is any signal being received. The only drawback I can think of on the sideways versus vertical is that it seems realistic to be buried sideways, but rare to be buried vertically--so carrying the beacon "sideways" could be more likely to result in a vertical orientation on burial. Maybe try a zippered pants pocket with the leash around a belt? You lose vital data in most cases but that is my personal preferred carrying location. Hope this helps, and shoot me an email if it's helpful. Unfortunately I can't get so deep into the math because I don't understand the math! My understanding is that the analog tone is closest to 1-antenna analog with auto-sensitivity as you suggested, although there may very well be more to it that I'm not aware of. There are no details such as match or physics because even the most advanced users don't need this info, and in nearly all cases it only distracts from the important stuff. Some of it is also likely proprietary info. If you want to send me an email I can put you in touch with the product manager in Switzerland who may be able to answer some questions on that level. Regarding switching from a pulse or Barryvox S to an F1 to do a alternate search--I definitely dont think that is the most efficient means to do this. If you'd like some insight on performing these searches with a pulse and Barryvox S, this blog post may be helpful, and includes video links at the end to some videos going over micro box, etc, with Mammut digital/analog beacons. If you have further questions best to get in touch directly at my email address above.